True confession: I’ve been dieting for the past two weeks. She says it’s a way of life. Ok, it’s a new way of life but I sure feel good. And I’ve already lost two pounds—maybe because I’m paying attention to portions. What I really like about my new way of life is that it embraces this delicious recipe for Hot Spanakopi Dip. Serve it to a crowd to keep your portions under control. Don’t let them finish it before you grab a crudité-full. In a large, covered frying pan, wilt spinach, half at a time, using 2 tablespoons of water and medium heat and stirring often. Remove from heat and squeeze spinach repeatedly over a fine mesh colander to remove all liquid. Chop roughly when cool. In that same frying pan, heat olive oil on medium-high, then add onion and garlic. Cook, stirring occasionally for 5 minutes or until onion turns light brown. 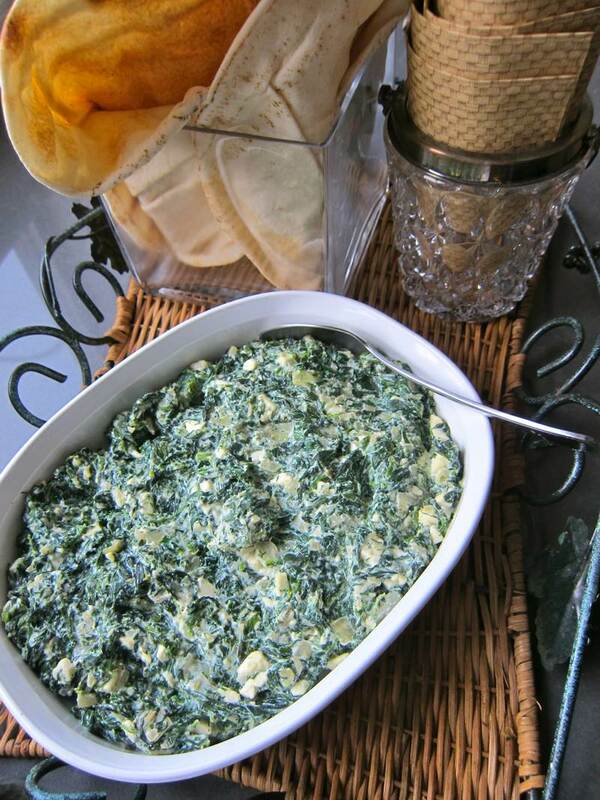 Add ricotta and spinach. Reduce heat to medium and cook for 5 minutes, stirring, until liquid disappears. Remove from heat, then add remaining ingredients. Transfer dip to an oven-proof serving dish and heat for 5-8 minutes in the oven. Serve on small plates with toast triangles, pita chips or crudités: carrots, celery endive, cauliflower, bell pepper. Serves 12. 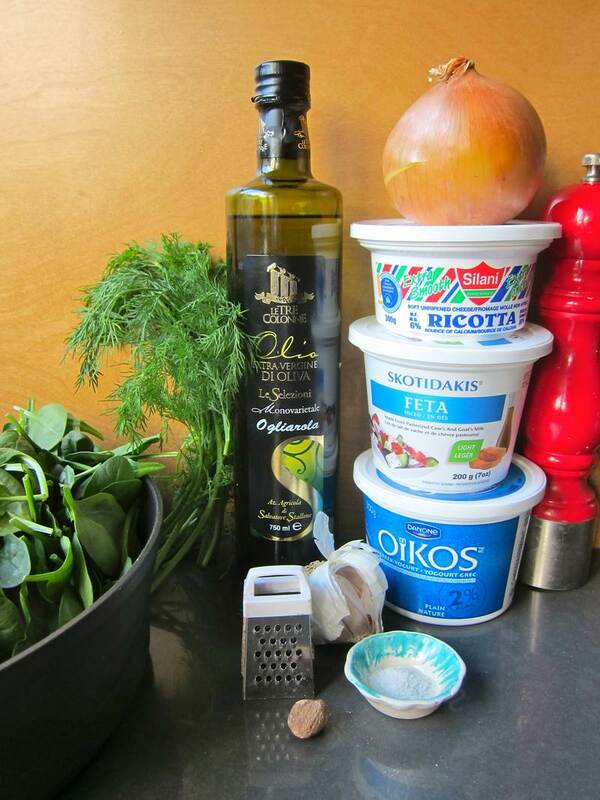 Inspiration for Hot Spanakopi Dip came from Chatelaine Magazine‘s Spaniko-Pizza recipe, in their December 2013 issue—that and a lifetime of appreciating Greek food flavours. Looking for something fun to do next week that will also help a really good cause? Join me at Battle of the Bands! Are you an app addict? Here are eight wellness apps to help you reach your health goals. If you’re seeking guilt-free pleasure, avoid similar dips that call for a cup of mayonnaise and a full fat cup of sour cream. I’m off for a dip in the ocean, so any comments or questions will be answered asap. True confessions? How many spoonfuls do you eat at a time? I’d say 3 tablespoons full, or 5 if you’re really hungry. Once you taste it you’ll want to keep dipping. Looks like a delicious appetizer for the coming holidays. Indeed!!! Or for any gathering where tasty, healthy food is required. Sounds and is. Wait until you try it. Did u say Ocean Dip? I love ALL dips…hint. I love dips too. Ocean Dip is my favourite. Spanikopi Dip is a close second. Coudn’t wait for the next dinner party, made half the recipe…simply delicious! Thank you for this, Holly! Why am I not surprised? Such fun to share a good recipe. Welcome!! This looks really good and I’m glad you mentioned that lower fat versions of both the feta and the ricotta would work well. I completely over-indulged at the Thanksgiving table and need to get back on track this week and/or send the leftover pies and sweets with my hubby to his office. Thank you for sharing your recipe! Thanks for noticing my fat consciousness Allison. I keep the calories down when it doesn’t interfere too much with flavour. If you love to eat good food it helps. And, I don’t know about you, but I can’t digest super rich food anymore. That, and it’s good to try to maintain some kind of a waist.